Moore Make Up Experience: Don't let your hands tell on you! Don't let your hands tell on you! Please don't let you hands tell on you! Often, we neglect the one body part that shows signs of aging first.Our hands, nails and cuticles fall victim to winter's dry air very quickly. 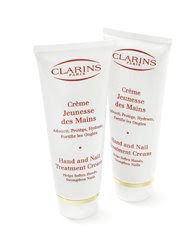 Clarins hand and nail treatment cream is a double duty product that specifically targets aging hands. Not only does it moisturize hands, cuticles and nails, it helps to fade nasty age spots. If you can't remember to put it on after you wash your hands, at least treat yourself before bed and keep a tube on your night stand. Try a once a week treatment of hand cream followed with gloves at bed time to keep those hands young and fabulous! Where can I find this product? Happy New Year to you both! Thanks!